On behalf of the entire Board, Board President Peggy Oster welcomed members of the Winter Track & Field team and their coaches to the meeting to receive special recognition. The boys 4x400 Meter Relay Team of Matt McIntyre, Ajay Olson, Jake Saltzer and Steven Zucker set a school record while placing 1st at the Meet of Champions, also set a school record as Group 4 State champions and placed 9th overall in the United States at the New Balance Nationals. Senior Erica Lawrence, who was unable to attend, was the North 2, Group 4 Sectional Champion in the shot put for the second year in a row while breaking her own school record for a third time this season at the Meet of Champions, where she placed 4th. Senior Lauren Triarsi was a North 2, Group 4 Champion in the 55 meter hurdles, set a school record at the Group 4 Championship where she placed 7th, and placed 24th at the Meet of Champions. And sophomore Katie Hamilton came back from an early injury to compete in the 800 meter, placing 3rd in the North 2, Group 4 Sectionals, 4th in the Group 4 Championship, and 3rd at the Meet of Champions where she set a new school record. Business Administrator Dana Sullivan provided a report on capital and maintenance projects for 2019 and 2020, noting that the district creates a five-year capital plan for planning purposes and that the district’s architect and supervisor of buildings and grounds join her in meeting every year with each principal to update the plan and re-prioritize projects as needed. Mrs. Sullivan reviewed planned projects for Summer 2019, including the Kehler Stadium Renovation, which is underway; toilet and lobby renovations at Edison and Roosevelt Intermediate Schools; replacement of classroom and stairwell doors along with security gates at Westfield High School and both intermediate schools; renovation of the WHS television studio and installation of emergency generators. She outlined proposed projects for Summer 2019 and 2020 that include ceiling and light replacements, painting, resurfacing floors, concrete repairs, security enhancements, and refinishing gymnasium floors. Mrs. Sullivan said additional possible projects discussed for Summer 2020 include door replacement at all elementary schools, HVAC upgrades, various classroom renovations, locker replacement in locker rooms, blacktop and asphalt replacement, partial roof replacement at Jefferson School and a possible turf field at WHS. The Board accepted with regret the retirements of substitute Patricia Minsky, occupational therapist Susan Orben, and Edison secretary Claudia Watkins. Ms. Minsky began as a paraprofessional in 2008 and has enjoyed her connection with both students and staff. For the past 16 years, Ms. Orben has worked with dedication as an OT in the district, making a difference in the lives of our younger students. And while it is hard to imagine Edison without Ms. Watkins, who has worked with six principals during her tenure and is knowledgeable and gracious, she is looking forward to a more relaxed lifestyle in retirement. We wish them all well as they prepare to retire as of June 30, 2019. Facilities Committee Chair Gretchan Ohlig reported on a recent committee meeting at which the five-year capital plan was reviewed. While the Board approved the five-year plan, Ms. Ohlig reiterated that the plan is a “living, breathing document” and that priorities may shift, resulting in some changes during the five years. Ms. Ohlig also noted a contract award on the Finance agenda for door replacements at Westfield High School and at both intermediate schools, along with a contract for the volt service that provides digital electricity. The Board approved both contracts. Long Range Planning Chair Amy Root stated that the committee’s next meeting is scheduled for April 2 at which a number of topics will be discussed. The Board approved the 2019-2020 Student Activity Fee Guidelines and Procedures. Policies Committee Chair Brendan Galligan stated that, provided no additional snow or emergency day is used, schools will be closed on Friday, May 24. The Board approved district field trips as correlated with curriculum. A gift of $2,524 from the Tamaques School PTO – Steam funds to purchase five Chrome Books. A gift of $367 from the Westfield High School PTSO to purchase a chair for Teacher Awards Night. A gift of $42,570 from the Washington School PTO to update the Washington School playground. A gift of $32,245.22 from the Wilson School PTO to update the Wilson School playground. Technology Committee Chair Michael Bielen stated that digital electricity will be among the topics discussed at the committee’s next meeting. Board member Robert Garrison reported that Marc Herzog of Papa Bear Digital Protection was the guest speaker at the Wilson PTO meeting on Wednesday, March 27. Board member Kent Diamond noted that both the Tamaques PTO and the Westfield Memorial Library Board would hold meetings on Thursday, March 28. 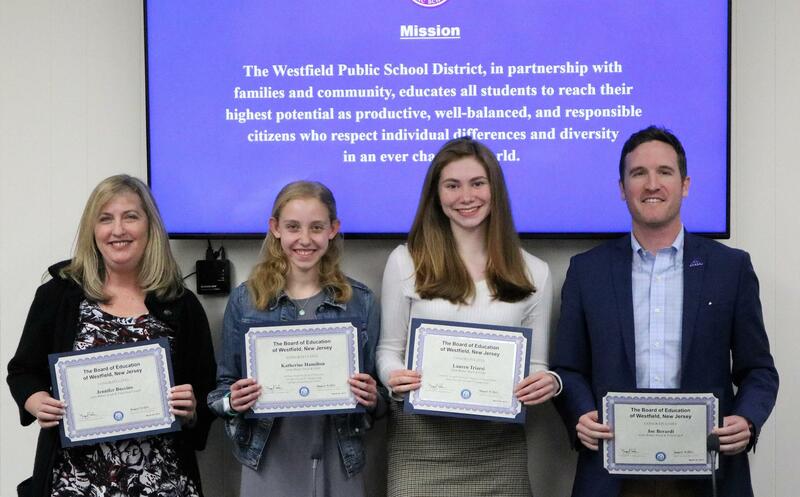 Board Vice President Amy Root stated that she was looking forward to a meeting with members of the Westfield Green Team on Thursday, March 28. Mrs. Oster reported on a recent meeting of the Westfield High School PTSO where topics discussed included the upcoming screening of Angst: Raising Awareness Around Anxiety on April 9 at 6:30 p.m. at the high school. Admission is free and space is limited; those interested in attending are encouraged to reserve tickets at www.showclix.com/event/angst-westfield-high-school. Community Service Week was also discussed, Mrs. Oster stated, with every student at WHS contributing to the project of sorting/packing individual bags of toiletries for local charitable organizations including the Westfield non-profit Bonds of Courage which supports our troops, veterans and their families. Mrs. Oster also noted that the WHS-PTSO continues to work on a Career Day, scheduled for April 30. The Board heard from two residents concerned about plans by PSE&G to install taller utility poles with a more powerful electric line in certain Westfield neighborhoods. Mrs. Oster stated that the Board’s foremost concern is the safety of our students and that the Board will continue to follow the project to make sure that concern is taken into consideration. 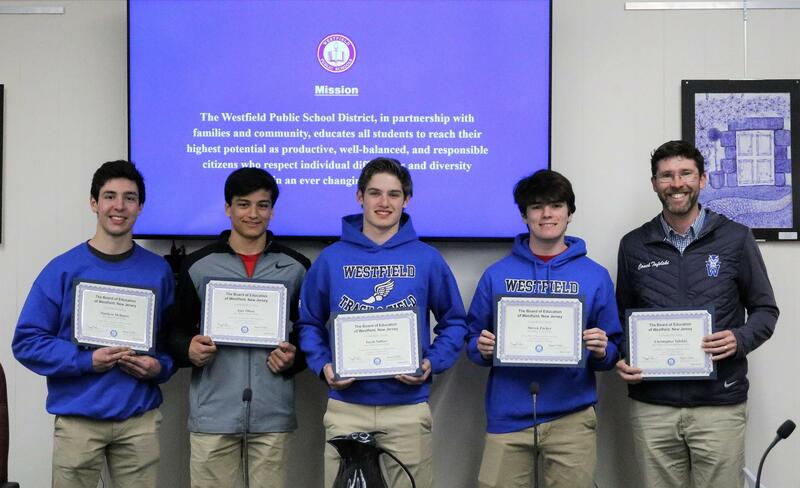 HIGH SCHOOL Nine Westfield High School juniors earned perfect scores on sections of the February 2019 ACT, bringing to 13 the number of WHS students scoring a 36. Congratulations to juniors Mark Falletta (Science & STEM), Brad Hornbeck (Math), Alexander Joseph (Math, Science & STEM), Greta McLaughlin (Reading), Stephen Park (Science), Sandrine Perez (Science), Celeste Scott (Reading), Jonathan Sherman (Science & Reading), and Abigail Sternberg (Reading). Previously announced were Henry Meiselman (Science & STEM), Abbey Zidel (English), Brianna Weber (Reading), and Jacob Rock (English & Reading). For a second consecutive year, the Westfield Public School District has been named one of the “Best Communities for Music Education” in the nation for its outstanding commitment to music education. This prestigious recognition is awarded by the National Association of Music Merchants (NAMM) Foundation to districts that demonstrate outstanding achievement in efforts to provide music access and education to all students. Congratulations to K-12 Supervisor of Visual and Performing Arts Thomas Weber and all of our hard-working, talented student-musicians and instructors. On the heels of its successful trip to Indianapolis to perform in the Music for All National Concert Band Festival comes more good news about the Westfield High School Wind Ensemble: For only the second time in school history, the Wind Ensemble has been invited to perform at the New Jersey State Band Gala on May 5 at Bridgewater Raritan High School. Each region selects four ensembles to represent them at the State Gala, totalling just 12 bands from across the state. Congratulations to the Wind Ensemble and to band directors Christopher Vitale and Trevor Sindorf. Congratulations to sophomore Kelly Eagan (Double Bass) and freshman Amy Xiao (Violin) who will perform with the All-State Orchestra at the NJEA Convention in Atlantic City and at NJPAC in November. Kudos to Orchestra Director Craig Stanton as well. Mr. Stanton has more good news to report: Diavoli Blu, a small chamber group from Westfield High School, performed during the opening breakfast of the New Jersey Women’s Leadership Conference on March 14. This was the first performance for this small group which is made up of students from the WHS Chamber Orchestra. Mr. Stanton says they performed well and learned a lot from the experience. Congratulations to Mr. Stanton and members of the group: Morgan Eng (Violin 1, 12th Grade), Sydney Butler (Violin 2, 11th Grade), Amy Xiao (Violin 3, 9th Grade), Sofia Lemberg (Viola, 12th Grade), Dustin Paden (Cello, 11th Grade), Jeremy Cha (Cello, 12th Grade). Congratulations to the cast and crew of Roosevelt Intermediate School’s production of “Bye Bye Birdie” under the direction of Kimberly Jonny and to the cast and crew of “Sweet Charity” under the direction of Daniel Devlin at Westfield High School. A lot of hours and hard work -- not to mention talent -- go into these amazing school productions. A special thanks to the parent volunteers who help with all of the behind-the-scenes details. This is a reminder that Friday, April 12 is the deadline for nominations for the 27th Annual Charles Philhower Fellowship Award which recognizes an outstanding elementary school teacher each year. Nominations should specify ways in which the teacher has demonstrated outstanding teaching, interest in children, and continued pursuit of professional growth. To be eligible for the award, a teacher must have worked full-time in grades K-5 in Westfield for a minimum of 5 years. Nomination letters should be sent to: Charles Philhower Fellowship Committee of the Rotary Club of Westfield, c/o Office of the Superintendent of Schools, 302 Elm Street, Westfield, NJ 07090 or emailed to rotaryphilhower@westfieldnjk12.org. At its general meeting on Thursday, April 25, the Franklin School PTO is hosting an important presentation for the public, entitled “This is Your Brain on Phones: Smartphone & Social Media Overuse.” The forum will be conducted by Sean Keagan Foley, assistant director at Prevention Links. The meeting begins at 7:30 p.m. The Westfield High School PTSO is hosting a special screening of the documentary “Angst: Raising Awareness Around Anxiety,” on Tuesday, April 9 at 6:30 p.m. at WHS. Attendees are invited to arrive at 6:20 p.m. to participate in a meditative deep breathing exercise. An informative panel discussion will follow the screening; K-12 Director of Guidance and Counseling Maureen Mazzarese will moderate the discussion. Admission is free and space is limited. Reserve your ticket at www.showclix.com/event/angst-westfield-high-school. The Westfield Historic Preservation Commission invites middle and senior high school students to submit a work of art or creative writing that imagines a favorite place in Westfield as it may have existed in another era. Any original essay, story, poem, drawing, painting or model may be entered. The deadline for entries is Monday, April 15. For additional information, please visit westfieldnj.gov/historicpreservation. All Westfield Public Schools will be closed for Spring Break from Monday, April 15 through Friday, April 19. The next meeting of the Westfield Board of Education will be held on Tuesday, April 30 at 7:30 p.m. at 302 Elm Street. Please note that this is a change from the original date of April 23. The complete agenda will be available on Friday, April 26 on the Board section of the district website and in the Business Office at 302 Elm Street.